Just for fun, I thought I’d share a little project I did, that unbeknownst to me, would be so popular I think I spent about $2.50 on the whole thing!! First, I have to give you a little History about where I live; I moved into this beautiful 1912 home about 4 years ago...I had only seen it from the outside, but I loved it for years!! It was “For Sale”, and I knew I couldn't afford to buy it. One day, I drove by and the sign had been taken down, I was so sad because, in my dreams, I had still had hoped to live in it one day. And then, God intervened!!! There’s just no other way to say it! I drove by, saddened that the house had sold, this ONE time I turned around at the end of the street, instead of driving on to the intersection. I think just to see it one last time and kinda say Goodbye. When I came back from the opposite direction I saw something that I hadn't seen the first time I drove by, it was in the window now facing me, “For Rent” and a telephone number. My heart skipped. I quickly pulled over got my cellphone out and called the number. I got an answer, too. It was a man who recognized my voice and my life, it turned out that we had gone to the same school, his family and my family had been in many classes, together. He told me he had just put the sign up 20 minutes earlier and if I could stay there, he’d meet me in 10-15 mins. And we’d find a way to make it work! And we did!! That’s how I came to be in the house I now call my home. I almost cry with joy as I write this out to share with you, how great our God is! Okay, so on with the project!! When we opened the door to my new home, It had all kinds of wonderful built-ins and moldings, and picture window, etc.. Though it was a bit tough to tell, as the elderly woman who had vacated it several years before had everything painted white, and I don’t mean a pretty white on white theme…more like ceiling paint white, that hadn’t been redone in about at least 20 years with big old heavy upholstery on the window, hiding the gorgeous moldings, until you got to the kitchen!! That, she had updated! Unfortunately, it was sometime in the ’70s. Everything was yellow, the ceiling the walls the doors and the beautifully molded frames for the doors. What wasn’t yellow was the vinyl/Formica backsplash of white with the gold starburst (c’mon you all remember someone who had that at one point)! 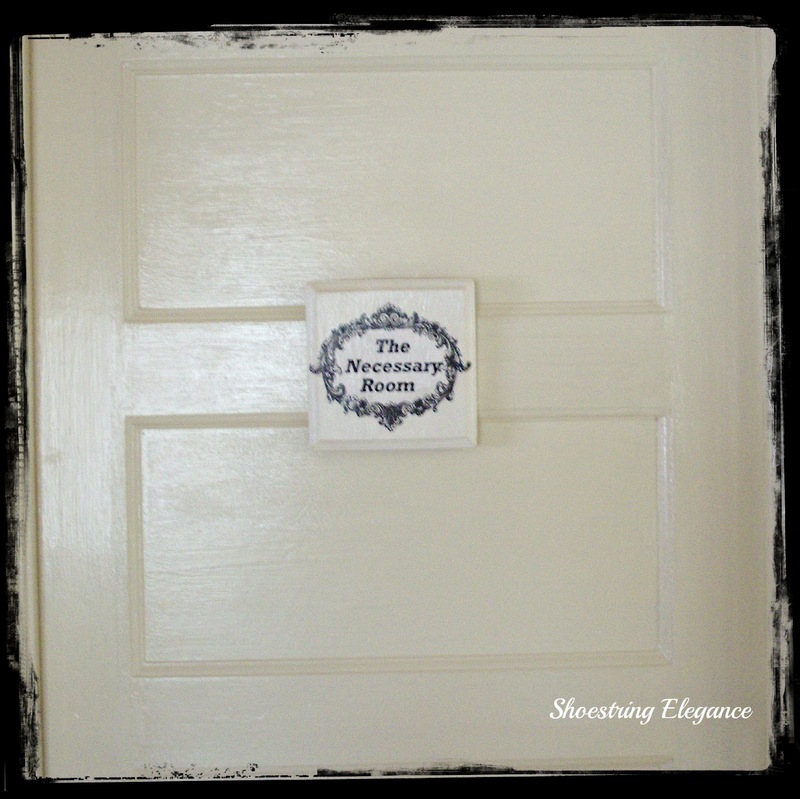 Anyway, I have rambled on…one of the first things I did was paint the doors and moldings in the kitchen back to their glorious porcelain white... Did I mention the bathroom door is in the kitchen??! Well, I should have, because that’s what I wanted to share with you today!! 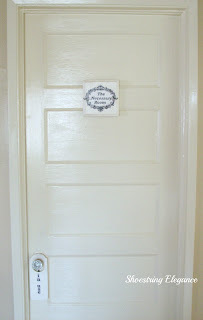 After painting the door and molding, I wanted, someway, for people to know where the restroom was without having to open three different doors in hopes they may have found it!! Oh yeah, did I mention, none of the doors have locks?? Yeah, no! Not one. So, I remembered this cute little needlepoint sign I had seen years before, that I thought would be perfect!! Borrowed some graphics from Cathe Holden @ JSIM and the Graphics Fairy, bought a very inexpensive, bare, square plaque and a 59 cent door hang and created, what I think is a very fun, yet somewhat sophisticated way to let people know where that room was and to ensure them their privacy!! Everyone, that has been here has had a good laugh and declared their Love for this little project. I enjoy it everyday! How Blessed am I? It could not have been easier, I didn’t even make a transfer of the graphics, I just got it to exactly the size I wanted and let the ink try overnight, cut only the typography out and sort of just modge-podged it on. I put a few coats of clear polyurethane on over and Voila!!! 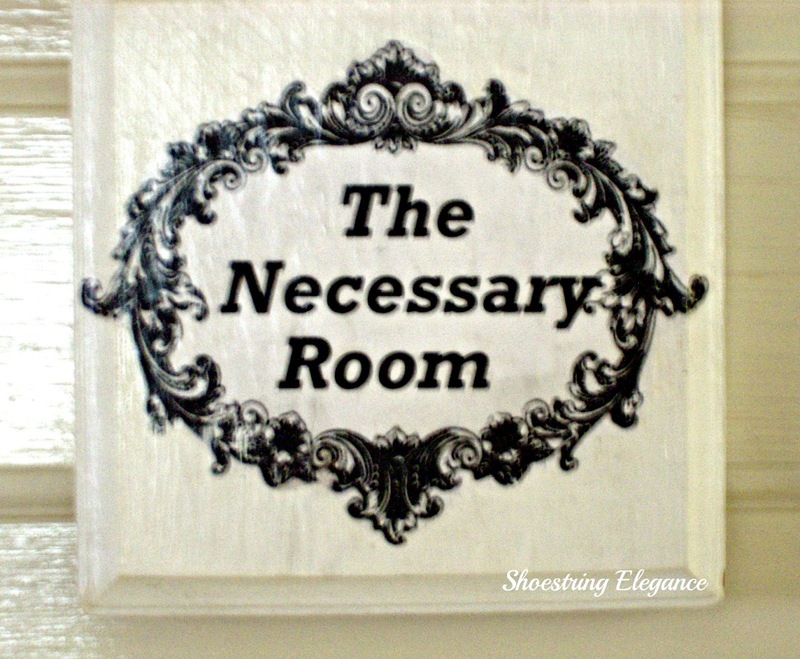 Your own little “Necessary Room”!! I hope you enjoy this as much as I did doing it!! Visiting from Funky Junk party, when I saw the Necessary Room sign, I had to click on it! I remember having a sign similiar to that years ago, but it was cross stitched! Enjoyed reading your post! I live in an old home too and love it!!! Thanks so much Melanie!! The only one I saw before this was cross-stitched as well!! Either way you have to love the simplicity to it!! Chris, Thank you, I'm so glad yo enjoyed it!! I will definitely be stopping by to see what you're up to as well!! Hugs, ~Theresa. Cute. Thank you for linking up to Rustic Restorations Weekend. Thanks for having the Party, Tammy!! Cute post! I found you at BNOTP! Thanks so much Tammy and Misti!! Thanks for hosting such a lovely party, Marilyn!! Thank you all so much for your kind words and lovely comments!!! @ Mary, as you can see, I can so relate!!! I hope you make one, End the confusion!!! @ Cathe, You, too, my dear it has been far too long!! My first visit with you and truly enjoyed it. What a remarkable feature on obtaining your home. Loved it. I am joining your other friend as a follower. In fact, I am so impressed with your blog, I would like to introduce you on my Pink Saturday, if you have no objection. The hostess, Beverly, likes us to feature a new blog friend. Keep up the good work. LV, Good morning!! Thank you so much for your beautiful comments, and I would consider it a great honor to be introduced on your Pink Saturday!! No objections, just Love and Gratitude coming from me!! 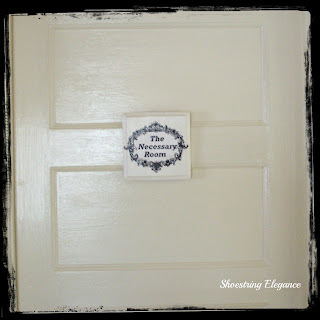 Visiting from fadedcharmcottage.blogspot.com Clicked on the necessary room sign because I'm getting my house ready for the market. This week I'm working on the guest bathroom and think your sign will be a perfect addition to my door "in the middle". Yay, Jeannie! I hope it helps! I'll never forget being in London when I was 18 and looking for the "necessary room" and not realizing I was seeing it when the sign on the door said "water closet." I like your story about how you came to 'acquire' the house. It was really meant to be. 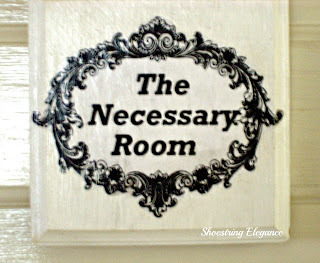 I have never heard it called the 'necessary' room before. I like that name. Thanks, Kelly! I know the name is funny, but truly what room is completely Necessary in a house? lol..thanks for popping by. Thanks so much, Marilou!! So sorry to have missed your comment before! You are So right!!! I have met the nicest people!! Welcome to blogland!! So nice to meet you! Happy PINK SAturday! Thanks so much, Kay Ellen! I love that kind of"magic" Elaine!!! Thanks! Keep up the great work and I will definitely be back! Thanks so much Stacey!! I believe in "kindred spirits" too, therefore we must be!! Thanks for sharing with me and peace and Many Blessing be with you as well!!. I look forward to seeing you more! Thanks so much for kind words, Debbie! !And thanks for allowing me to share with you over @ Toot Your Horn Tuesday!!! Fun place!! Hugs and Many Blessings!! Thanks so much, Kathy!! Love your Blog!!! Entered your contest, became a follower and linked up this post.. I hope I have many more to share with you in the near future! !